I have had a gentle inauguration into the third trimester so far. I would not say that I had any great burst of energy in the second trimester, but now I am definitely more tired than I was then. Oh well. Also, I now have a new nightly companion: heartburn. It is unpleasant…but so much more pleasant than some other things I’ve experienced already (ahem, entire first trimester, I’m talking about you). The baby is still rocking and rolling in there, which is really sweet to feel. My mobility is still very good except on the occasions when he drops his entire body to the bottom of my uterus. And then, my friends, I waddle. It was a big weekend for us: we bought a car! It’s a new-to-us Honda Accord. Given that we are still driving the Honda Civic I bought when I was 16, I hope we’ll have a good long time with this one too. Eric worked really hard to prep for the inspection and negotiation, and he did the most amazing job. I was seriously impressed. I said a few things here and there, but he really had it under control. We feel great about the car and the price we negotiated, and we’re happy to be able to cross this off our list. Now to install the carseat! It was also a really special weekend because we celebrated Mother’s Day as parents for the first time. I didn’t have any expectations at all–I hoped that maybe Eric would buy me flowers (and he did! ), but otherwise I hadn’t imagined anything special. Eric also gave me a card from our baby, and it made me cry profusely. It was the sweetest, sweetest thing, and I will treasure it forever. It was a total surprise, which made it even more moving. Speaking of moving, our parish usually honors mothers on Mother’s Day, but I never paid too much attention to it. Until now. At mass the priest offered a special prayer for us, and then invited us to come up and receive a flower. I was already crying–finding my place in the long line of mothers and grandmothers and great-grandmothers and women throughout all of time who have loved and nurtured their children is enough to knock me off my feet. And I was just so grateful. I have wanted to be a mom for as long as I can remember. I dreamed for years and years about being married and having a family. When I was younger, I imagined that this would happen right away, and while I am older than I imagined I would be, I would not change a thing. Being able to get pregnant is a gift. 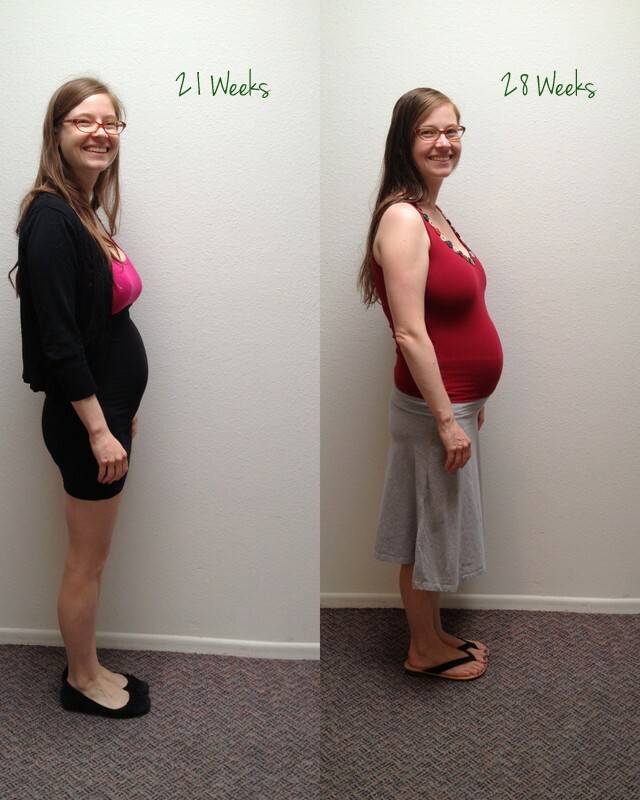 Having a healthy pregnancy is a gift. Being in a good place in life to welcome a child is a gift. And having a loving and caring and supportive partner to share it with you is a gift. Every single one of them is priceless. As I was walking back to our pew with my flower in my hand, my eyes fell on Eric, smiling so sweetly and proudly at me, and I just absolutely lost it, the way I lost it right before I walked down the aisle at our wedding: tears that are just a rushing well of joy overflowing, tears that express gratitude better than any words can, tears that hold the greatest hope and happiness for the future. I am looking forward to years with finger-painted Mother’s Day cards and picnics in the park and years when Mother’s Day will coincide with graduations, and years (deep breath) when I will hopefully get to enjoy my children and my grandchildren. And I’m even looking forward to the years when my children might rather be off with their friends than hanging out with me, because Mother’s Day will always make me remember this weekend, this wonderful time of waiting and celebrating, the last weeks of our first child remaining a beautiful mystery, before we can stroke his soft skin and hear his newborn cries. When I think of this trip, here’s what I’ll remember. Cool breezes and white sand. 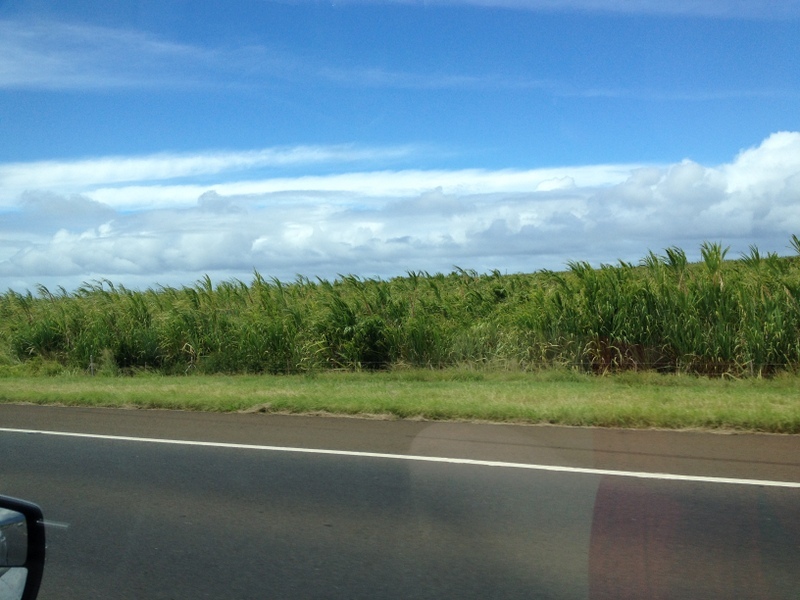 Preposterously green sugarcane flowing like locks of hair in the wind. A sky blue enough to break your heart. Pineapple, lots and lots of it. And those are just the tangible things. I’ll remember a feeling of total bliss and relaxation, an overwhelming sense of luxury in getting to spend so much time with my husband. A lot of laughter. 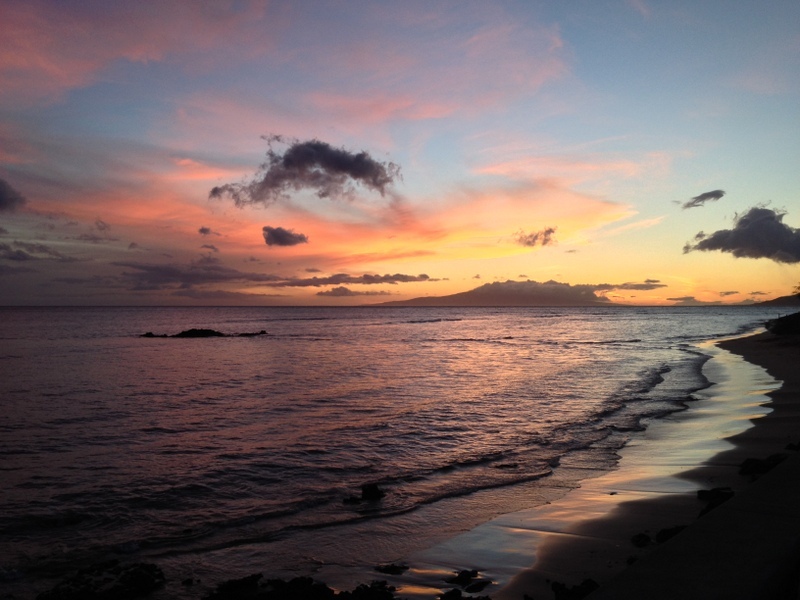 And that special Hawaii magic, by which I never fully adjust to the time change and instead just get up every morning at 6:30 and head out to the balcony with my book and my oatmeal, savoring the early hours to myself and looking forward to the adventures the day will hold. It was a great, great trip. This was the sunset we saw on our first night in town, when I was totally congested and feeling fairly miserable. The view helped a lot, and thankfully, every day I got better and better. The mountains were just stunning, and once again I couldn’t get over the richness of the greens and blues. We spent the first few days doing some light exploring, while I was still getting over my cold. This banyan tree takes up an entire city block. So amazing how it grows into itself and keeps branching further and further out. 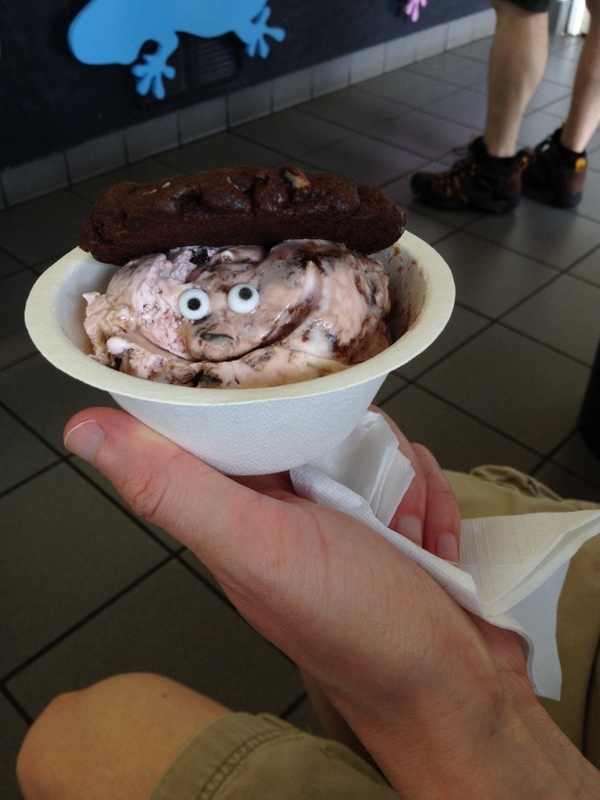 Our favorite spot in Lahaina was Banyan Treats, where Eric got this mo’o (it’s the Hawaiian word for gecko; thus the eyes). It was the sweetest family-run business, serving only local Maui Roselani ice cream. 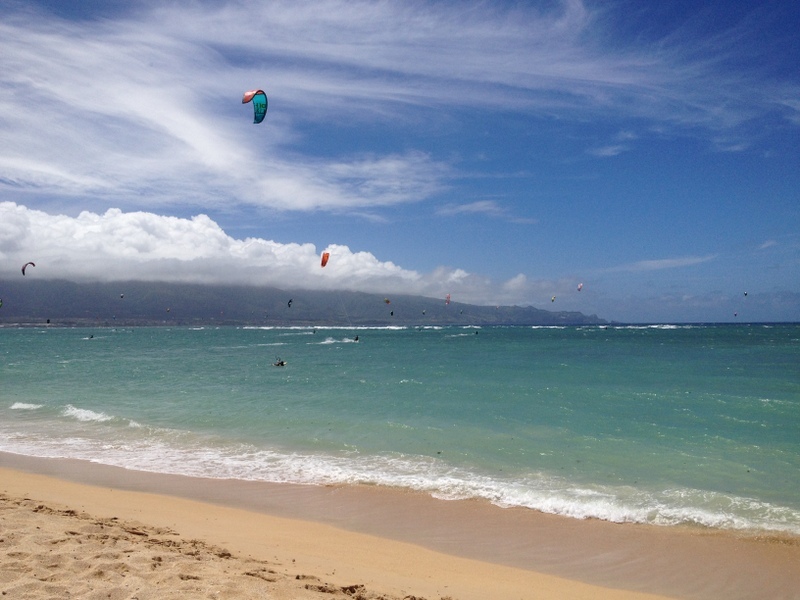 Ice cream and Hawaii are two sides of the same coin, no? We ate so well, and pretty affordably. 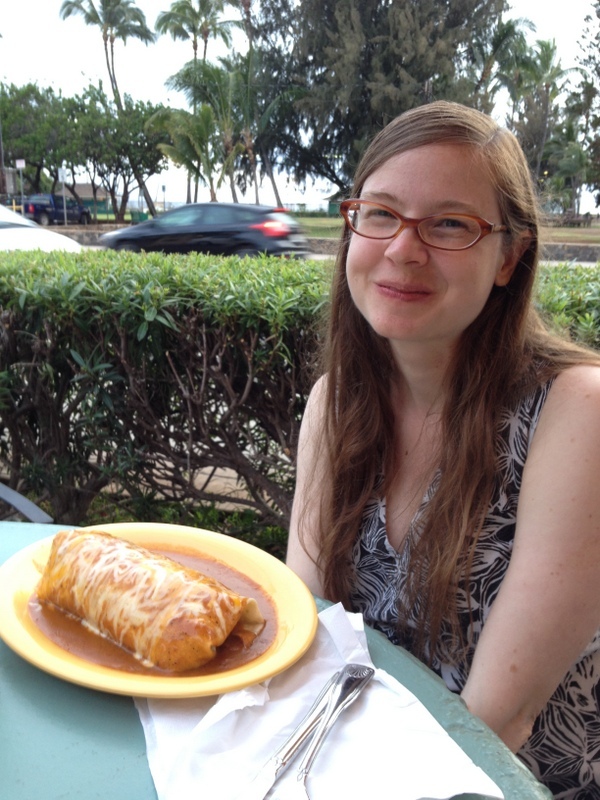 This is how you know your wife is pregnant: she sees a picture of a burrito in a magazine and has to have it. Thankfully, Eric is very obliging. 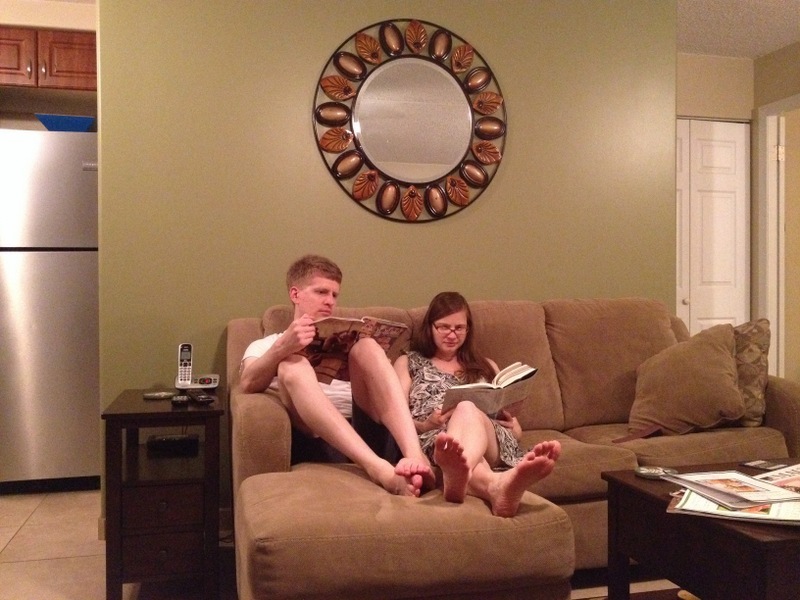 Every night we spread out on the couch and read for a few hours. It was so wonderful. Even though I look slightly deranged in this picture. We would do a quick email check every couple of days, but it was so good for us to unplug a little bit. I brought 4 books with me, and I read 3 of them. I call that a successful vacation. 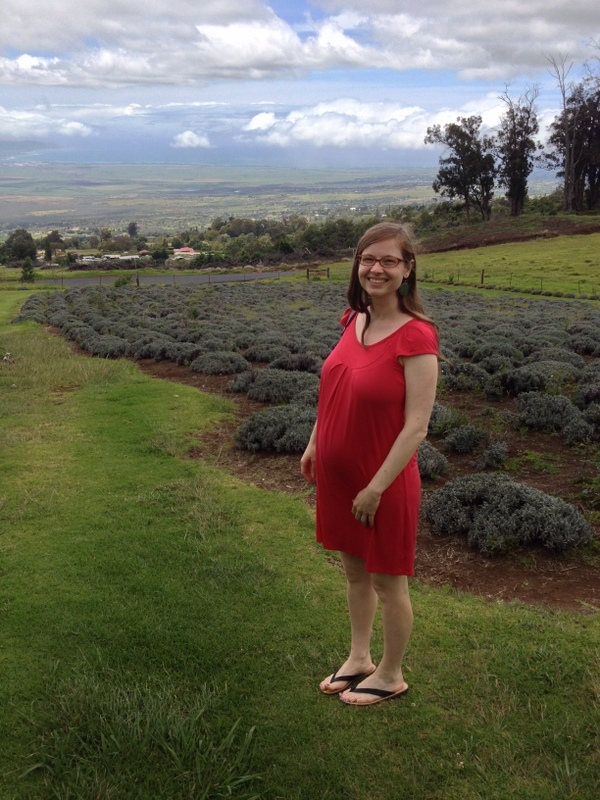 We made a jaunt up to a lavender farm on the side of a mountain, looking out over the ocean. So gorgeous. See what I mean about those blues and greens? This is a total car shot, but that only adds character, right? 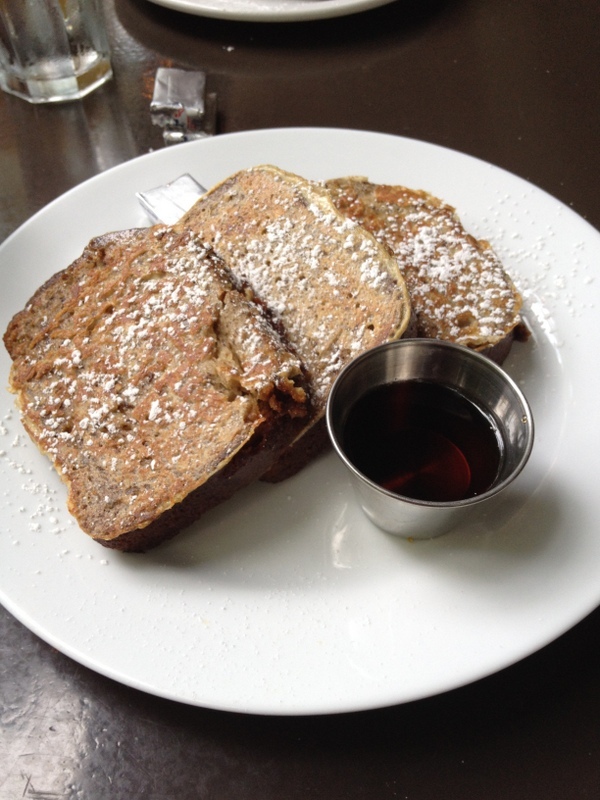 Back to breakfast: this is banana bread French toast. And yes, I ate it ALL. 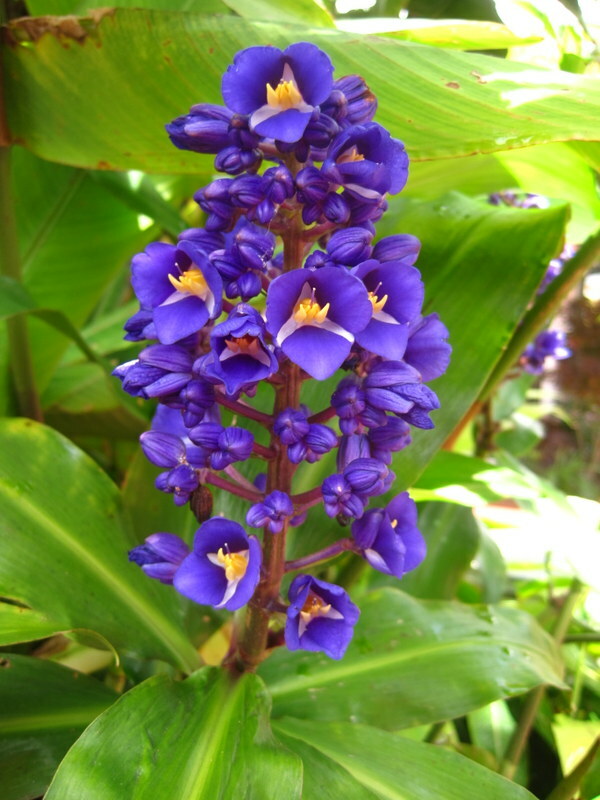 And I took so many pictures of the flowers. They were incredible. Isn’t this amazing? 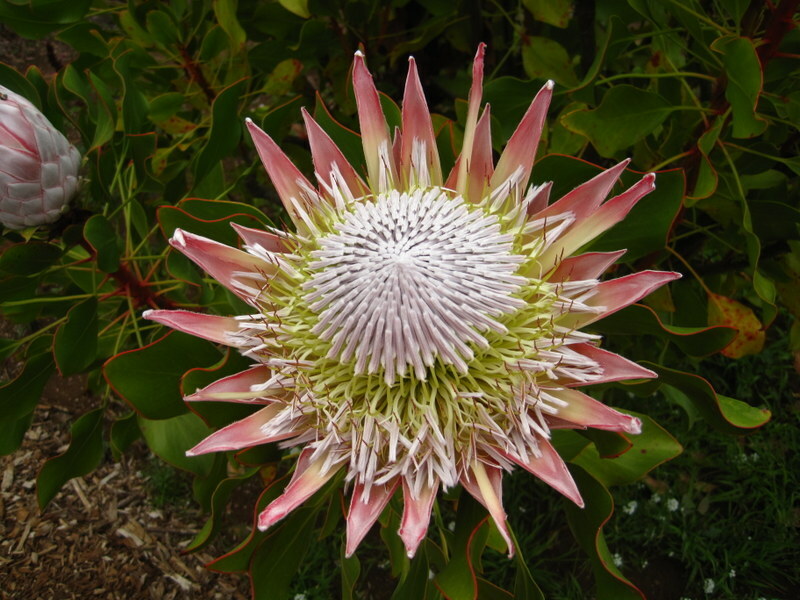 It’s a protea. This is the misty mountain scene at ‘Iao Needle. And, of course, we spent lots of time at the beach! The condo we rented came with so much beach gear, I couldn’t believe our luck. 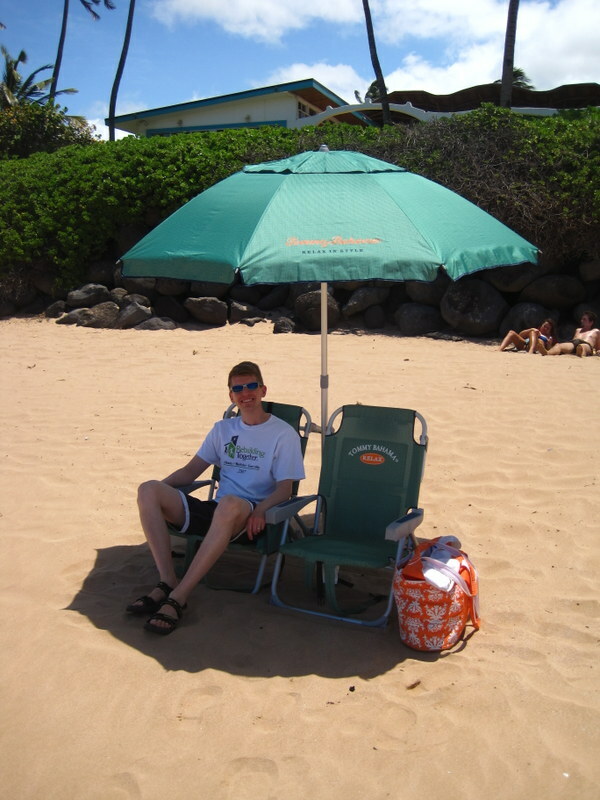 Sadly, it was way too windy to keep this umbrella up for more than five minutes, but the chairs were an awesome improvement over beach mats or towels. 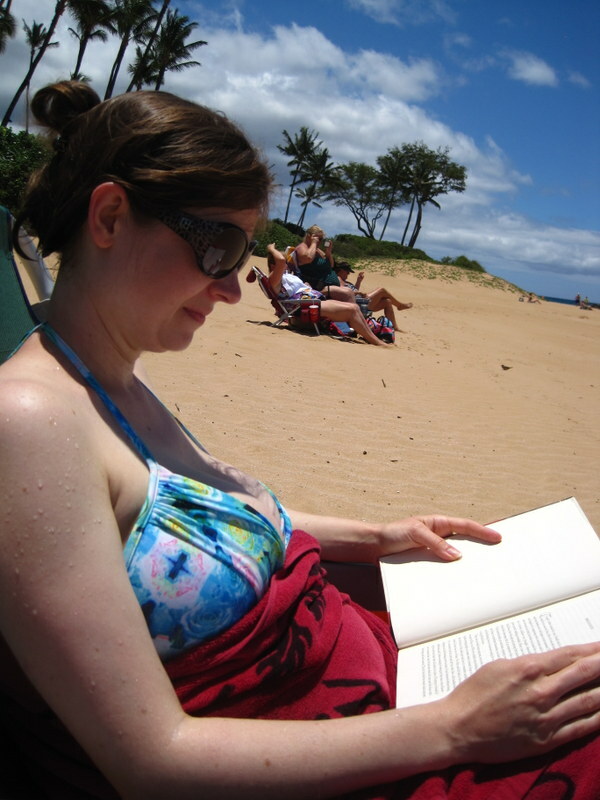 What we really wanted to do was sit and read (in between dips in the ocean), and read we did. I am devouring The Paris Wife here, and it was so fantastic, and it is lingering with me so much, that I might have to write a separate post about it. Our favorite beach was just two blocks from our condo, and we went almost every day. It was quiet and secluded, and everyone there knew each other. 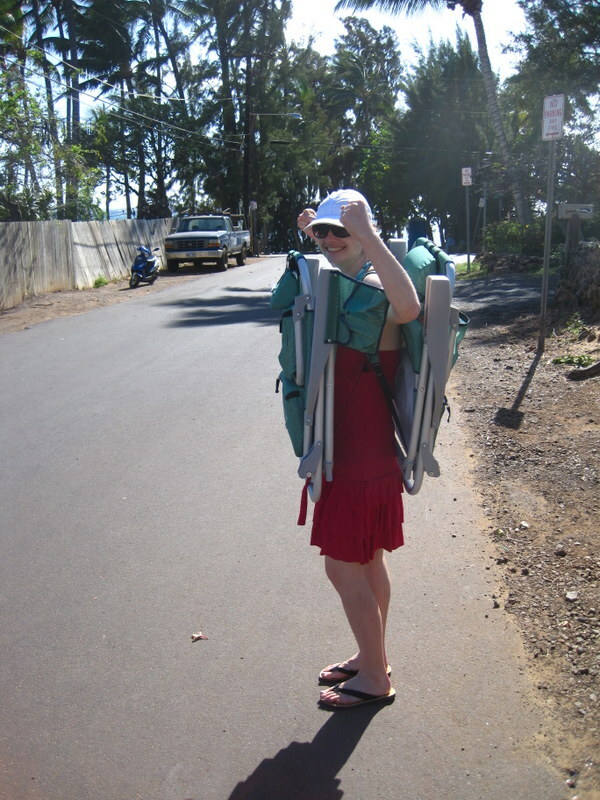 We decided to take the chairs one day, and I offered to carry them because the beach bag was way heavier. These chairs are so nice that they have backpack straps on them, so I just put one on my back and one on my front: practice for baby-wearing! 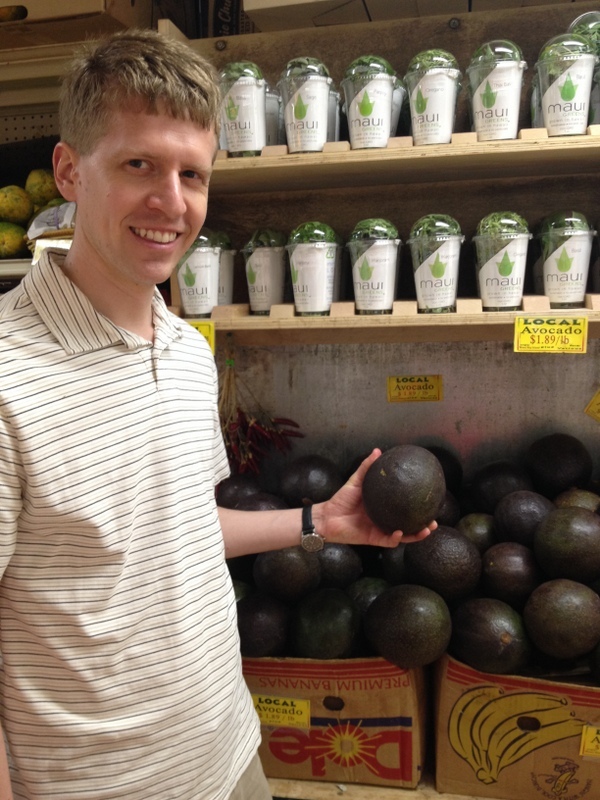 I have to stress that they were not heavy at all, but even still, Eric was slightly worried about this arrangement. As you can see, though, I am a chair-carrying boss! 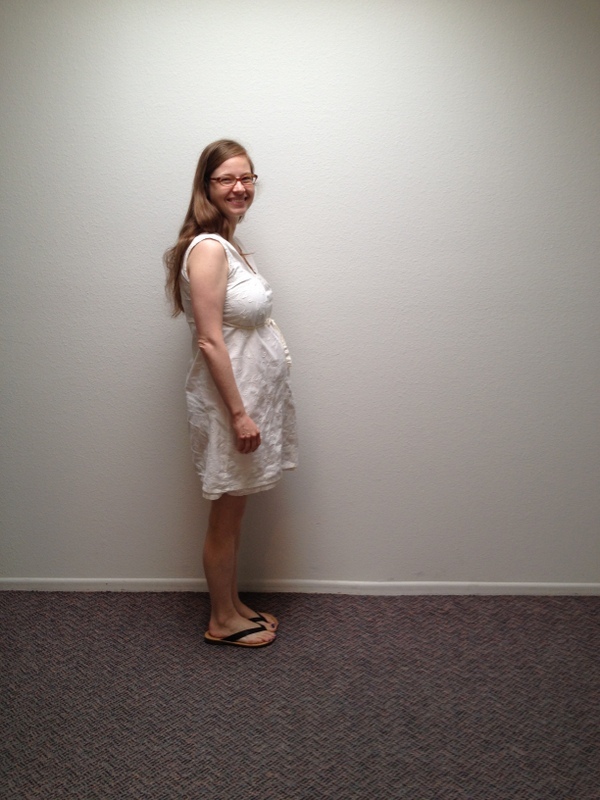 And I had to share this picture so you can see just how big the belly is! I love to think of showing these pictures to our baby one day! We thought and talked about him all the time, and he made this trip so special with his little kicks (and big kicks!) and the very fact of his exsitence. 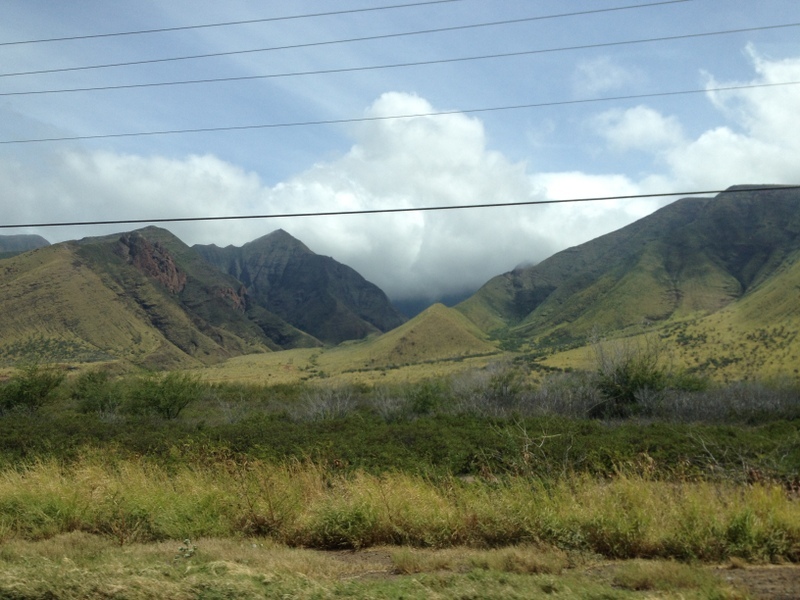 Two more Hawaii posts to come, on two of our favorite experiences there: swimming with sea turtles, and the beautiful yet harrowing road to Hana! May! This is going to be a fun month. Traveling time is over for me, and I’m excited to get back to baby prep. There are (of course) a million and one things we need to do, but I seem to have lucked out in the pregnancy hormones department, and I feel very calm and zen about it. And did I mention excited?! There is furniture to move and art to hang and stuff to buy and one very special map-themed baby shower to plan with Hillary. Hurray! At the same time, May is one of the busiest months for the freelance work that I do, and I’ve already gotten started on it. I am hoping to cram in as much as possible, since I’m sure every little bit of extra money helps when there’s a baby around. It’s still alternating between scorching hot and cool here, which makes for a nice change of exercise pace. Mostly I am still walking, but on really hot days I swim, and it feels great! Now that the book proposal is submitted (whee! ), I am hoping to get back to some projects I have really been wanting to dust off. I haven’t done any scrapbooking in ages, and even the baby’s quilt has been languishing while I have worked on my freelance deadlines. The turnarounds aren’t always so tight, though, so I hope I can really luxuriate in some crafting time this month, with my little kicking companion along for the ride. I took 800 pictures in April, and that’s more like it! (Especially when compared to November-January, when I was at my sickest: 80 photos, tops). I am sure that I’ll be taking 8,000 pictures a month when I have a tiny and adorable little model at my disposal, but this is a good start! What are your goals for this month? 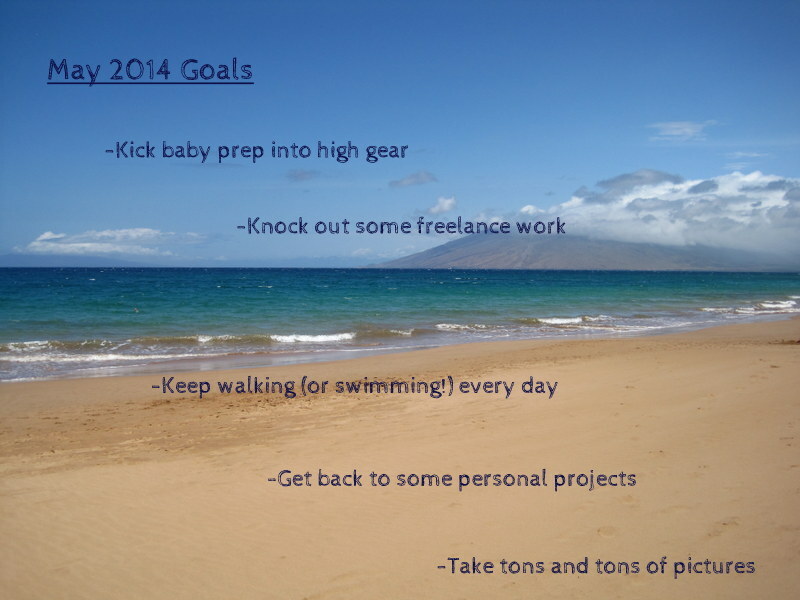 My April goals are updated here, and, just for fun, here are my May goals from last year. Update, June 2014: I was wondering to myself why it felt like May had blown past me, and then I remembered that I was mostly doing freelance work. Right! It was a great month for it, though, and I love having the work. Baby prep went great too–we bought a car (!!) and ordered a ton of stuff we need. Not much left to buy (of the big stuff, at least!). Hillary and I sent out the baby shower invites, so now there’s just crafting to be done: fun! Walking/swimming is still going well. I miss being able to walk outside in the cool evenings, but my little passenger keeps me needing the facilities all the time, so the gym it is! But even the walk down there after dinner is nice. It’s been great to have some free time for personal projects too. The quilt is coming right along, I’ve got Project Life stuff all over the kitchen table, and I have been reading novels voraciously. Delicious all around. I took 348 pictures in May, which is not bad at all. I don’t mean to make myself stress about the numbers at all–instead, what I want to do is cultivate a habit of keeping my camera clicking throughout my days. I never ever regret taking a picture, so I always want to take more! Hope you had a great month too, and happy summer! 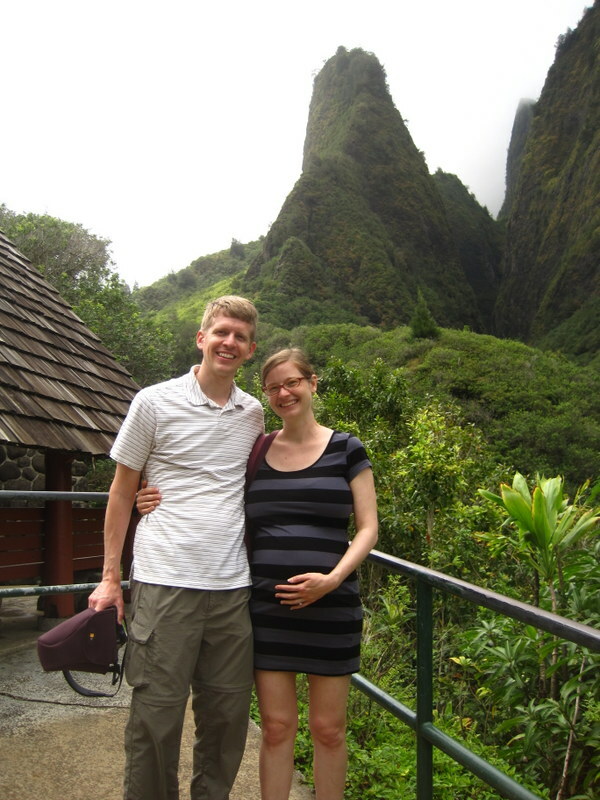 And we’re back from Hawaii and firmly planted in the third trimester! At least once a day Eric marvels at my belly, and I do too. The baby is around 2 pounds now, so today I told Eric he was going to get at least three times bigger, and his eyes turned into saucers. It was hilarious and awesome. 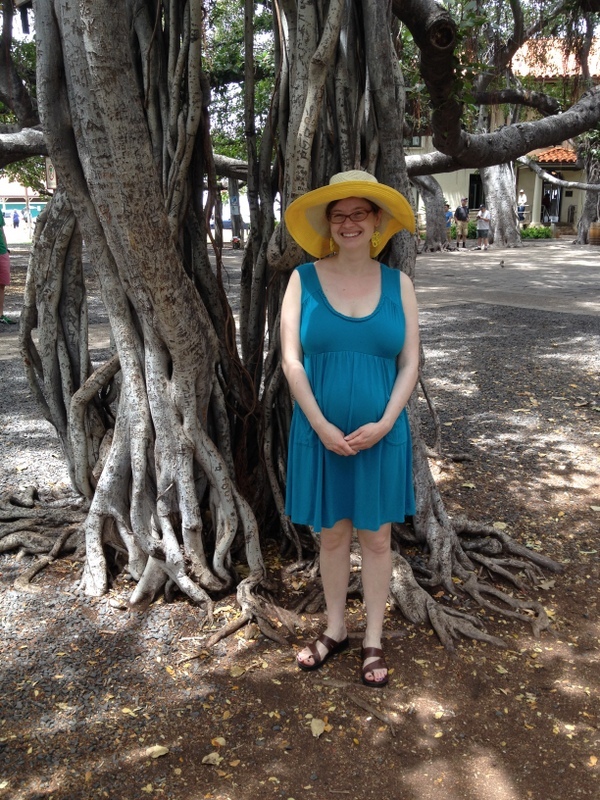 We had the most glorious time on Maui (the pictures, the stories–they will be coming atcha this week), and I was happy to recover from my cold fairly quickly. I really felt very good for most of the trip, with the exception of one night when the heartburn was killing me. Tums are my best friend, but I can’t take them after I’ve taken my iron supplement because the calcium blocks absorption. I was splayed on the couch of our condo rental looking miserable when Eric came and put his arms around me. “Is there anything I can do to help?” he asked. When I told him that he couldn’t and thanked him for his concern, he just smiled and said, “I want to be supportive. You are working very hard for our family.” Swoon. I am grateful for him about 72 times a day. 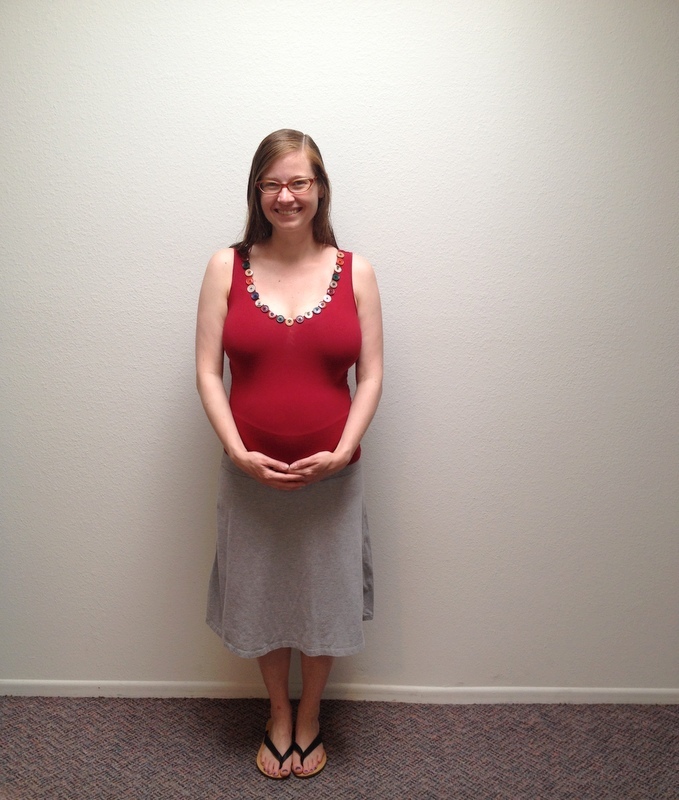 But back to the belly…it is expanding! I am down to a very small pile of pre-pregnancy clothes that I can still fit into, and my oversize pj shirts are no longer oversize at all. They feel like spandex! So, bigger sleepwear for me. And I think some combing of the thrift store is in order. My favorite one usually has good maternity stuff. 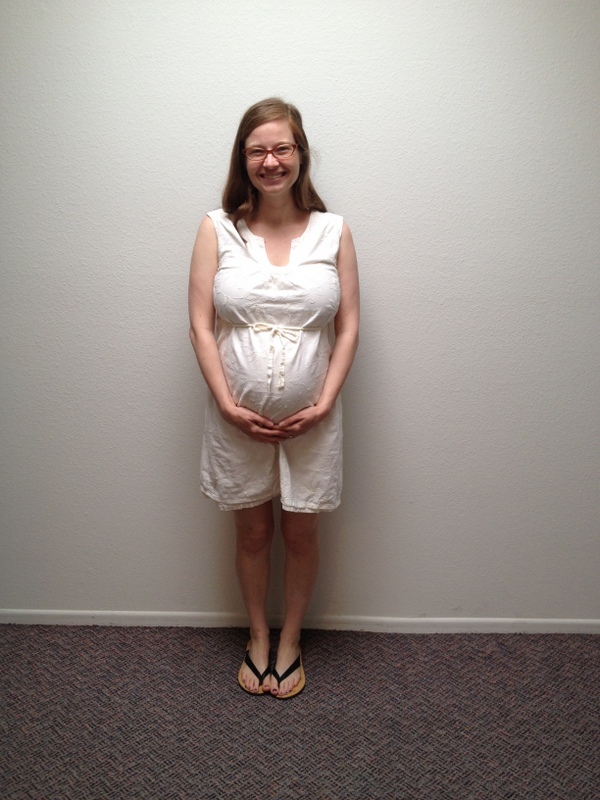 We had our 28-week appointment this weekend, and everything looks great! He did some break dancing in response to the loud Doppler machine, and it was kind of hard for the doctor to hear his heartbeat because he wouldn’t be still. We have an active baby on our hands! We’ll be seeing the doctor every two weeks now, which feels like a milestone. More on this tomorrow when I talk about May goals, but baby prep is officially switching into high gear. And that is going to be lots of fun! I am really savoring these weeks when I still feel very comfortable. My hands still fall asleep when I lie down, and my leg cramps are really becoming frequent, and there is heartburn every night, but all of this is nothing compared to the first trimester, and probably nothing compared to the discomfort of the last few weeks of pregnancy. Every day that I can still comfortably walk and sleep feels like a gift. And so does this sweet baby.